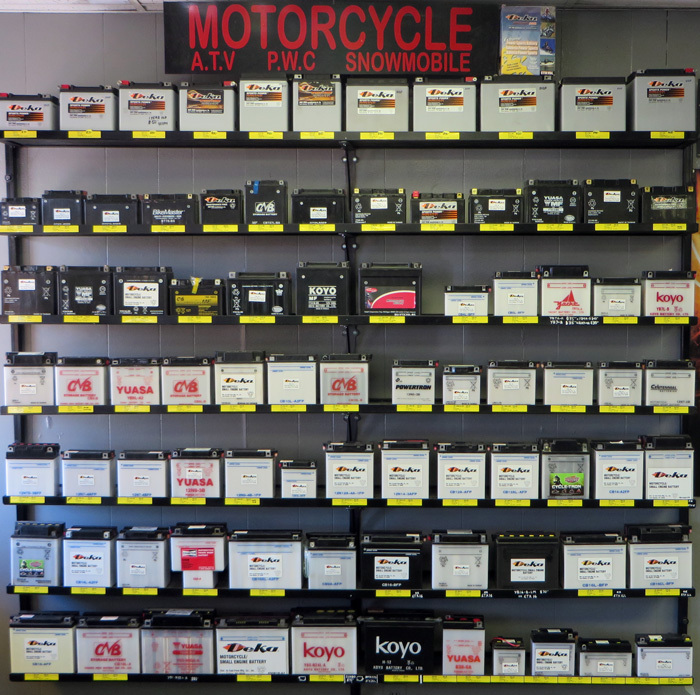 We carry over 250 different size cycle style batteries. You buy, we fill, you charge motorcycle batteries. Most not made in USA. New style lead acid A.G.M. You buy, we fill, you charge, never needs water again. Most not made in USA. Newest style lead acid A.G.M. Sealed at factory, high cranking. Made in the USA. Twelve popular sizes. Proper charging with a 2-Amp or less unit will extend service life. Initial charge should be for 4-6 hours. If your battery has removable vent caps, regularly check the electrolyte level and add distilled water. If battery will not be used for extended periods, disconnect cables, fully charge and store in a cool, dry place. AGM batteries are activated and charged out of the box. A special calcium alloy grid provides maximum power with excellent vibration resistance and spill proof design. Just connect the cables and you have the power to move.